Certain his old life is completely lost, Rick spends months hiding away in his room playing video games. He achieves the highest scores on so many games that he's approached by a government agency who claims to be trying to thwart a cyber attack on America that would destroy the technological infrastructure of the entire country. The agents say that the quick-thinking of a quarterback coupled with Nick's gaming experience make him perfect for this assignment. The problem is that there are no extra lives and this isn't just a game...but Rick doesn't have many other options at the moment. Entering "The Realm" gives Rick the one thing he thought he'd never have again: a body that's as fast and as strong as he ever was before the accident. But the more time he spends in The Realm, the more questions he has. What secrets are these agents keeping from him? What really happened to his father? How many others have gone into The Realm already...and failed? And perhaps most important, is he the hero they think he is? 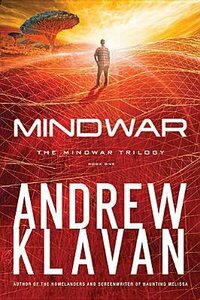 About "Mindwar (Unabridged, 7 CDS) (#01 in Mindwar Trilogy Audio Series)"
Andrew Klavan was hailed by Stephen King as ?the most original novelist of crime and suspense since Cornell Woolrich.? He is the recipient of two Edgar Awards and the author of such adult fiction bestsellers as True Crime and Don't Say a Word.